This species is accepted, and its native range is W. Central & Central U.S.A. to Mexico, Peru to S. South America. Malvastrum sulphureum (Gillies ex Hook. & Arn.) Griseb. Sida hederacea var. parvifolia Hemsl. Sida hederacea var. sulphurea (Gillies ex Hook. & Arn.) 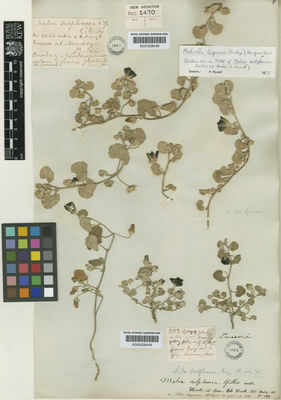 Baker f.
Sida leprosa var. hederacea (Douglas) K.Schum. Sida leprosa var. sulphurea (Gillies ex Hook. & Arn.) Hochr.